With the conclusion of this three-Grands Prix weekend, we draw ever closer to the end-of -year lull in Magic. Let’s talk about some new announcements and discuss the expected price drops in the comings weeks. If you are a Vorthos player, you may have been expecting this. In this article, Ugin explains to Jace that the only way to stop the Eldrazi is to seal them again. He instructs Jace to go to Innistrad and find Sorin and bring him back to Zendikar. Another important thing that Ugin mentions is that the Eldrazi Titans will planeswalk away when mortally threatened. There are a few expectations we can draw from these events. 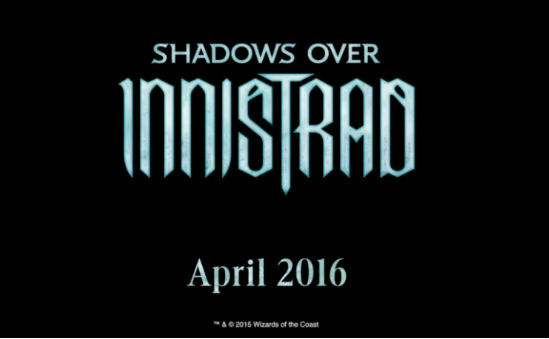 Shadows over Innistrad is the start of a new block. It will be treated like a large fall set. We may see flashback return in SOI but with a Snapcaster Mage RPTQ promo he will likely not return in the set. This is all of course speculation but so far the story articles seem to be a reliable way to tell the future. 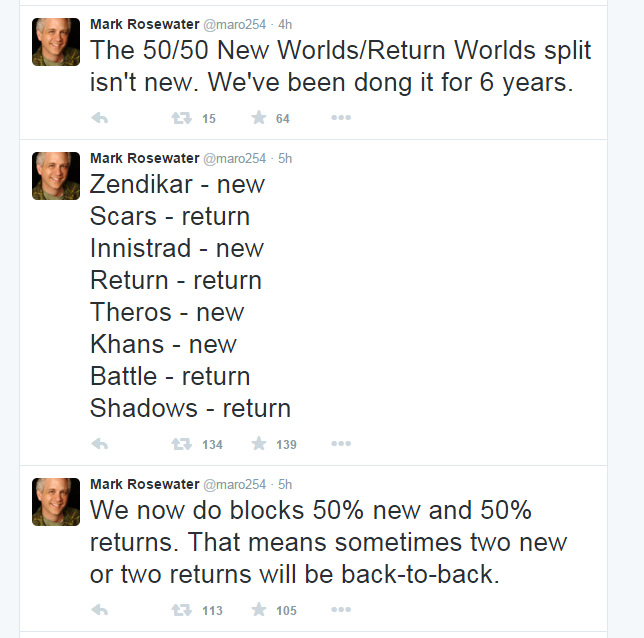 Why are we going back to Innistrad? With a real definition of what is “new” and what isn’t, I expect this to continue to in the future and be a conduit for important reprints outside of Modern Masters. We can expect the Fall 2016 set to be a “new” plane. Now that we’ve got that out of the way, let’s shift gears and talk about events. What events are left in the 2015 calendar year? Do you know how many weekends of Grands Prix are left? After this triple Grands Prix weekend, there are five left on three weekends to close out the year. Seattle/Tacoma (Legacy), Atlanta (Sealed), and Pittsburgh (Modern) are the last three Grands Prix in North America this year. There are two Standard GPs left, one in Brussels and one in Kobe, and that’s it! There is over a month off and then GP Oakland opens up the year with a Standard Grand Prix before almost another month off before the next set of Grands Prix after the release of Oath of the Gatewatch. 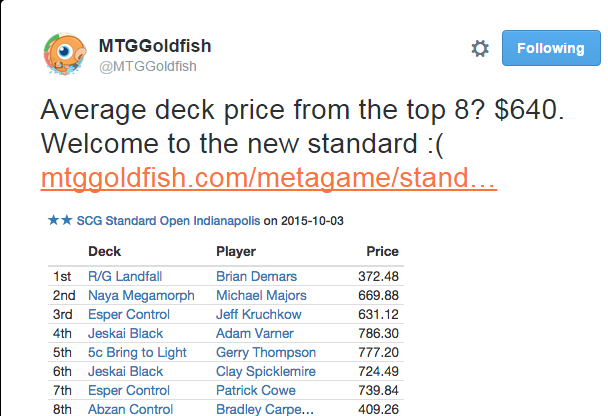 Thats not a lot of Standard being played outside of the LGS level. Let’s take a look at the other major circuit, the Star City Games Open Series. There are five SCG opens for the remainder of the year. Four are Standard (Philadelphia, Kansas City, Denver, and Las Vegas) and one is Legacy (New Jersey). That’s also not a lot of opportunities for the rest of the year to play in high level Magic events. What does this all mean? Well, it precludes the December price dips. You basically have one month to sell or trade any Standard cards you will not need for the rest of the year before their price starts to drop significantly. I already traded away my Gideon, Ally of Zendikar this weekend for Eternal playables. I would recommend dumping any Khans of Tarkir cards especially since there will be no more Standard Pro Tours to breathe new life into them before they rotate. 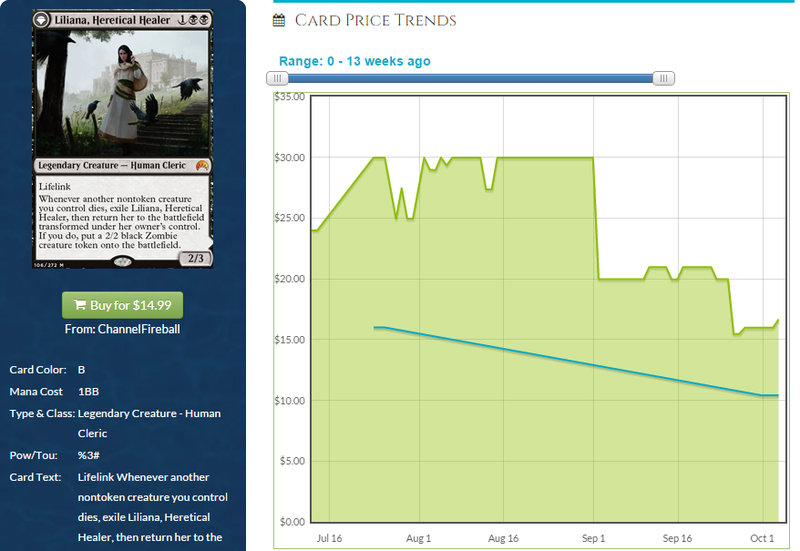 As you can see from this graph, the post Pro Tour price tag quickly dips into a yearly low in December. 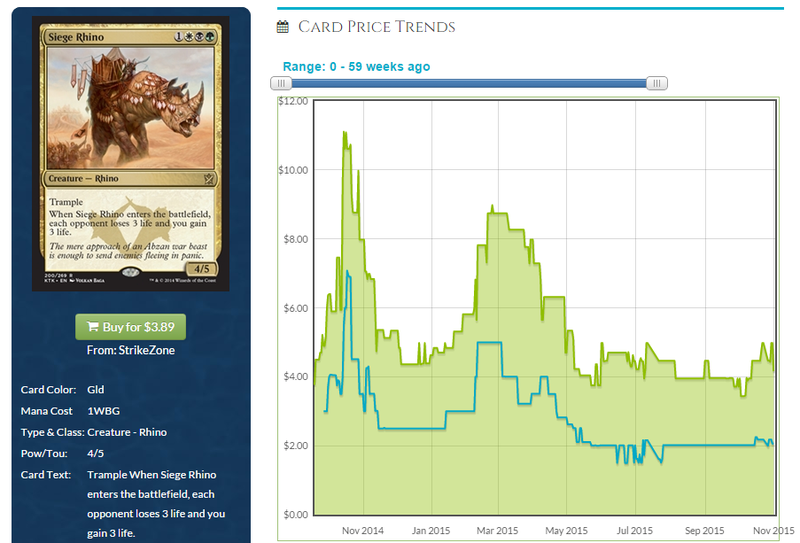 If you want to get expensive cards from Battle for Zendikar, I’d wait until then. Although Gideon doesn’t have a long price history, we can see he’s peaked and is already on his slow descent. I’m just guessing here but I could see Gideon being as cheap as $20 by Christmas. While it’s clear he will be a player in Standard for his entire lifetime, it is unwise to hold copies you’re not actively using. But, it’s not all gloom and doom for a buyer. These two lands have already shown up in some decks as a way to ramp out huge Eldrazi. It might not be a thing today but I feel like the deck is very close to breaking out. 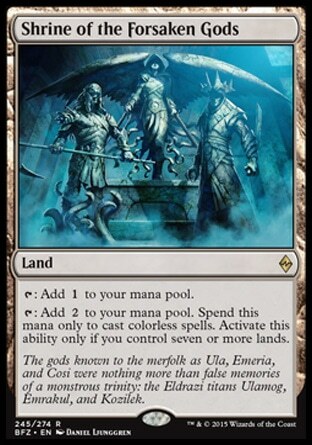 I wouldn’t be surprised if these two lands are the mainstay of a top tier deck in Oath of the Gatewatch. Kind of hilariously, right now that is the basis for one of the cheaper Standard decks as it doesn’t play any fetchlands, Gideons, or Jaces. At about $0.50 per land, I wouldn’t fault you for picking up a playset of each in preparation for Kozilek in Oath of the Gatewatch. Do you like the articles that Jeremy (@LengthyXemit) does for Grands Prix? I will be lucky enough to attend the last two American Grands Prix of the year and can provide some commentary for people looking to buy cards. Are there other questions you have for the Grand Prix process? I took a week off due to some work-related complications but I will have the Pucatrade article for next week! Hope you all had an awesome Halloween and I look forward to your comments below! It’s the week before the Pro Tour and all through the Internet, not a pro player was stirring, not even Tomoharu Saito. After a grueling tournament, two decks that only feature two colors battled it out in the finals of the Star City Games open in Indianapolis. This week we won’t be teaching any lessons. I’m going to go through the news with you. People are up in arms and truly enraged that stores would charge more than MSRP for anything. 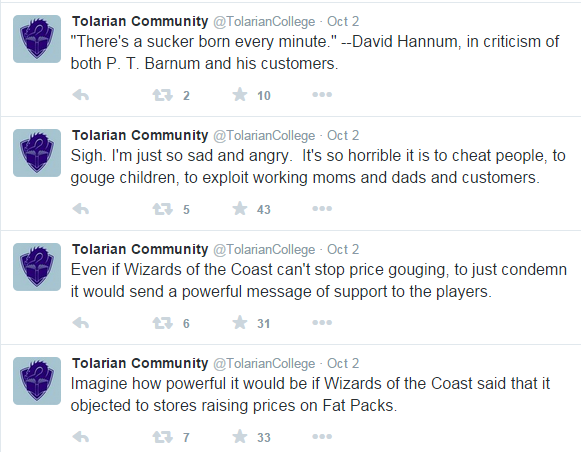 The Professor (content producer under the Tolarian Community College youtube channel), had some especially fierce criticism for stores that chose to raise their prices to above MSRP. I respect him a great deal for his huge contributions to the community (seriously if you haven’t checked out his videos I highly recommend them), but I don’t think he, like many people, have considered all of the options. Most stores sell almost every Magic sealed product for under MSRP. The exception is usually with limited print run stuff like From the Vault products and Modern Masters. The only reason to raise prices is because you will sell out of all your product. Large online stores can’t afford to be out of anything. If a customer comes to your website expecting to be able to buy a product and you can’t provide that product, they will buy from competitors. If that competitor has products in stock that you do not multiple times, you will lose that customer. What this means is that prices have to rise to curb demand. Stores are still in the business of selling product but the reality is they need to keep something in stock. You have the option of going to Walmart or Target and trying your luck at picking up a Fat pack but that’s not an option for everyone and the convenience of an online order is worth the $10 to some people. The other unfortunate problem with selling them at MSRP when in high demand is that people will buy them solely for the purpose of reselling them on auction sites like EBay. At this point the card store doesn’t get the extra money and it’s pocketed by people who don’t help grow the game. I’d rather a store get the money if people are going to pay that much. 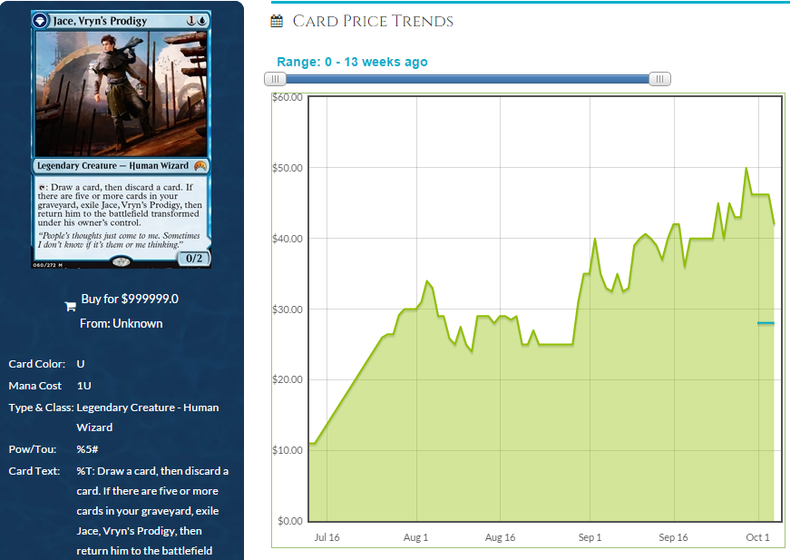 Saturday afternoon I looked at TCGPlayer and noticed there were only 29 total listings for Jace, Vryn’s Prodigy. Granted there is not usually much supply added on the weekends (stores generally don’t ship/list on weekends because they’re off), it was still unusual to see such low stock. Ten hours later there were three non-foil copies listed. While I don’t think this was a targeted buyout (because there weren’t a ton of copies listed by a single seller), it is indicative of future growth. He’s pretty much been on a steady rise since he came out. The small divets in his price are mostly due to small supply gluts. Compared to Liliana, Heretical Healer (the early frontrunner for best walker), Jace seems invincible. Liliana has seen some minor success and continues to fall. 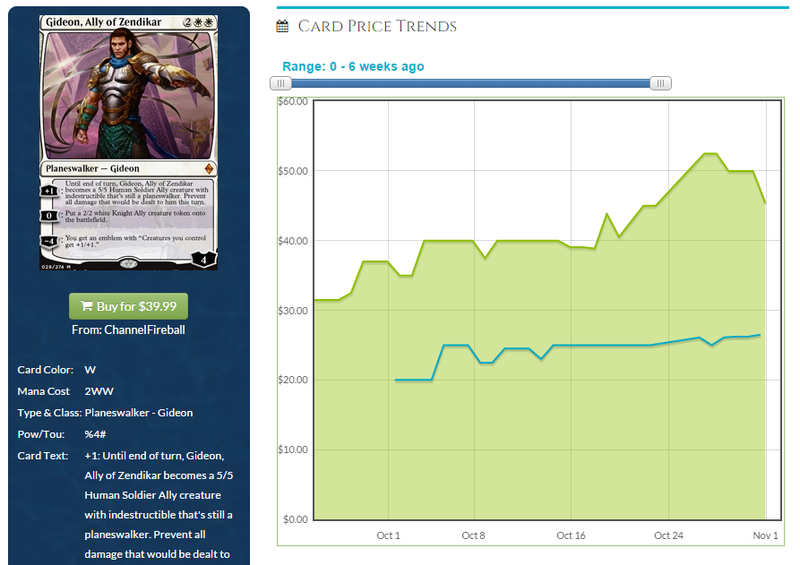 Even Nissa — who sees almost as much play as Jace in Standard — has been flat. Why is this? Well, Jace is a multi-format all-star blue spell that costs two mana. While being a good blue spell in Standard doesn’t always equate into a hit, it almost certainly does in Modern and Legacy (more blue-friendly formats). Jace passes early tests for mana cost and raw card power and continues to over perform in those formats. This card will likely mimic Liliana of the Veil’s pricing for the near future as it will be the most popular Planeswalker in Modern. Where does he go from here? There’s pretty much nowhere to go but up. Even though we have now seen Mythic rares in Event Decks, it is extremely unlikely we will see this Jace in the near future. The fact that Jace is a flip card makes him cost so much more money to produce so his chance of being in a sealed product are very low. I’ll assumed you’ve seen who won but, if not, congratulations to Brian Demars for his win including several turn 4 blow outs. People really like to underestimate the power of the red deck in week 1 and they paid the price. No, not the Ultimate Price, which would have been spectacular versus Demars. Ultimately it looks like the price will be paid to play these super multi-colored decks. 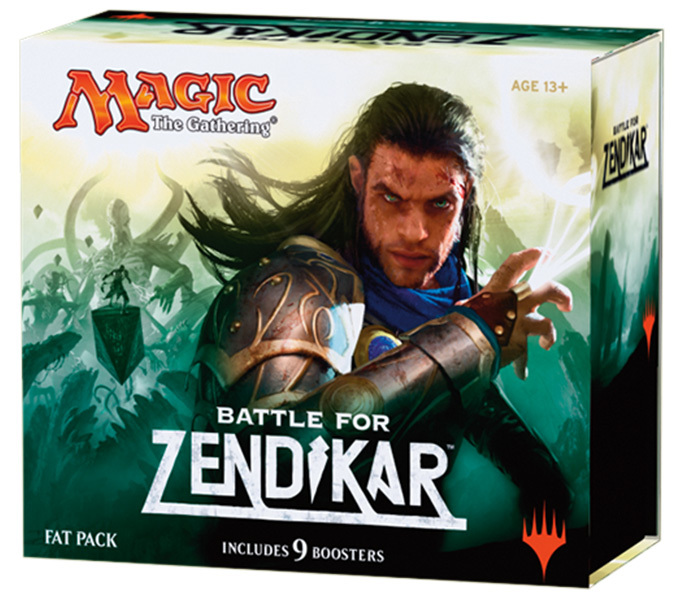 I don’t know if Standard will be as expensive as the all Mythic rare decks from the Doran deck days, but it’s showing here how much the price of Khans of Tarkir fetch lands is having on deck prices. As you can see here, the mostly mono-red deck still plays 10 fetch lands in it’s 21 land mana base. 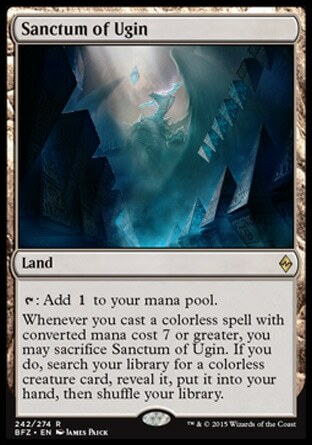 With the rotation of temples, people have to resort more to fetch / battle mana bases which will put more strain on already expensive Khans fetch lands. Pucatrade continues to be my #1 way to move cards. If you haven’t signed up already, you can use my referral link here. It has some useful tools for pruning your collection and predicting the future. 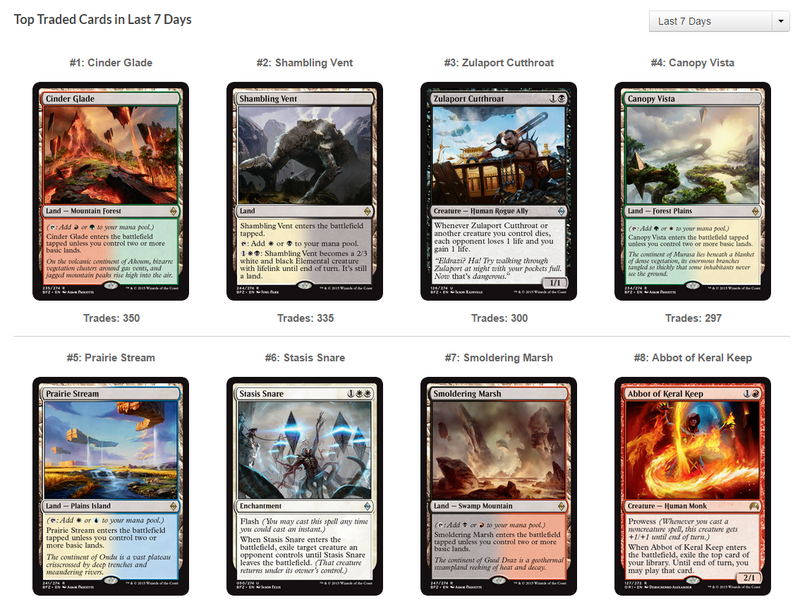 As of my writing, these are the top traded cards in the last 7 days. It’s pretty clear people want to finish their mana bases asap and I don’t blame them. But does that mean that these are the most popular cards? 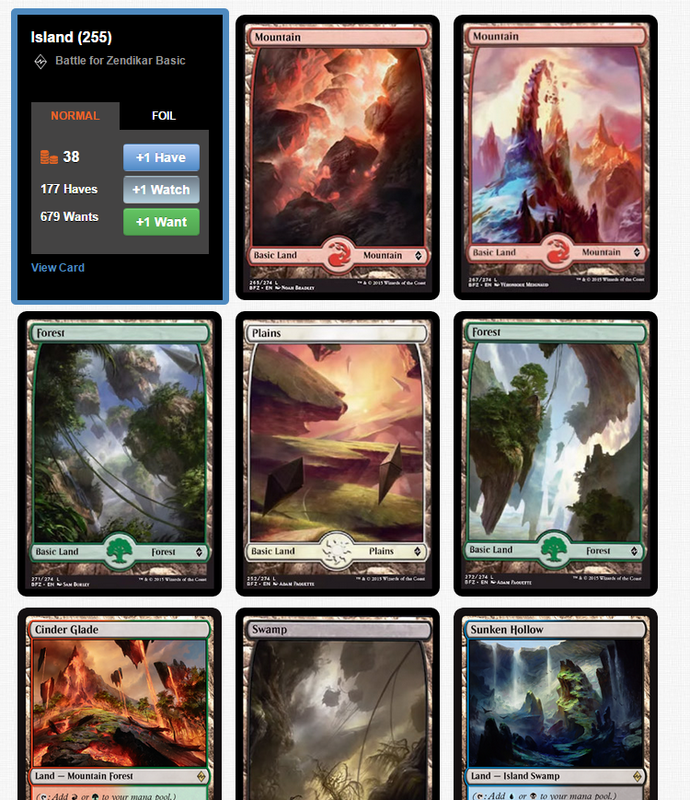 With some searching and filter magic you can see the most requested cards are actually basic lands. Unfortunately these filters are only available to Uncommon tier of support. From this we can see there is a large discrepancy in the number of “wants” vs the number of “haves.” Generally when the “Wants” exceed the “Haves” it means that people value the card more than the currently listed Pucatrade price. From this we can determine either the card is over valued by players or it is poised to go up. While I don’t believe this will last long with these basic lands, it is an easy avenue to move large numbers of lands that will be worth a lot less in the coming months. In closing, this week has been hectic and we will see more shifts as the ebb and flow of the Pro Tour. Will another red aggressive deck win it? Will a Dragonlord spread it’s wings over the Pro Tour? Will See the Unwritten break Ulamog out of his shell? Or will Siege Rhino win another one? We’ll find out soon and hopefully have some great things to talk about.